Julius Hudacek, pretending he’s Santa Claus, being pulled across the ice on a sled by a teammate. There’s a unwritten rule in professional hockey that says a player must never actually celebrate anything — a goal, a save, a hit, a fight, a victory — in any sort of exuberant manner that an opponent might somehow consider insulting. Hockey is a high-spirited sport and intentionally trying to stifle that spirit makes the sport less entertaining than it can be. It boggles the mind that people don’t want to see Alex Ovechkin feel the fire off his stick, or P.K. Subban do that shooting arrow thing of his. There’s probably (definitely) a certain amount of xenophobia and racism factoring into why some hockey folks specifically dislike Ovechkin and Subban’s respective exuberance, but if it’s just about hating on out-sized celebration those two have nothing on the current king of hockey showmanship… Julius Hudacek. A goalie for Orebro in the Swedish Hockey League, Hudacek has reimagined the concept of the victory celebration. After Orebro home wins Hudacek will come back out on the ice in order to perform some sort of grand salute to the team’s supporters still hanging around in the stands. These increasingly elaborate celebrations — ice-fishing tributes, motorcycle rides, Santa Claus imitations — are amazing. They’re bold, fun and totally ridiculous, exactly the sort of thing that would send the Don Cherry-types into frothing mindless rages. 16) Hudacek does somersault after victory vs. Färjestad. 15) Hudacek figure-skates, climbs on net after victory vs. Luleå. 14) Hudacek wears funny hat and glasses after victory vs. Växjö Lakers. 13) Hudacek kayaking after victory vs. Luleå. 12) Hudacek pulls children from the crowd, gets them to shoot pucks at him while he’s wearing a Viking helmet after a victory vs. Linköping. 11) Hudacek pimps a Swedish Eurovision contender while wearing a bodysuit designed like the Swedish flag after victory vs. Färjestad. 10) Hudacek goes cross-country skiing after victory vs. Modo. 9) Hudacek tries to waveboard his stick after a victory vs. Linköping. 8) Hudacek tries to juggle after victory vs. Växjö Lakers. 7) Hudacek goes ice-fishing, takes ride on ice-resurfacing machine after victory vs. Djurgarden. 6) Hudacek celebrates with mascot after Slovakia Cup game, does cartwheel on ice. 5) Hudacek and his teammates perform “YMCA” after winning a LGBT-supporting “Pride Match” vs. Frolunda. 4) Hudacek performs the Macarena with children pulled from the crowd after victory vs. Frolunda. 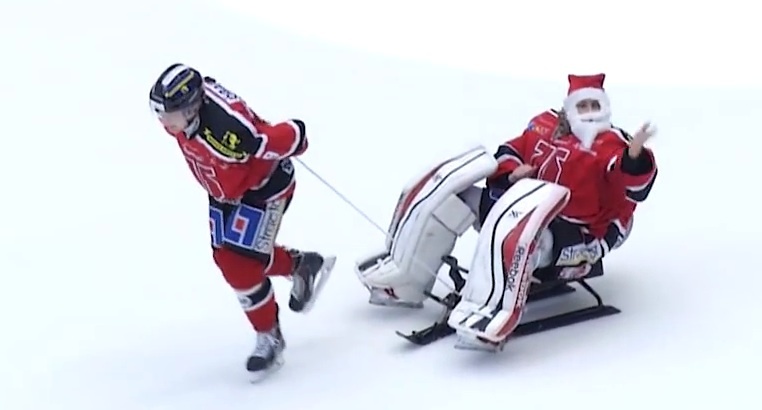 3) Hudacek pretends he’s Santa Claus after victory vs. Skellefteå, has “reindeer” teammate pull him across ice in a sled until he falls of sled. 2) Hudacek and fellow goalie Henrik Lundberg had a game of leapfrog after a shootout victory vs. Brynäs (Lundberg played the game, Hudacek took the shootout). 1) Hudacek rides motorcycle after victory over HV71.